Are you looking for some great companionship? Abby and Lily are two sweet, good-natured and healthy siblings that are looking for a furever home. They are wonderful adult dogs that get along with everyone. They like hanging out, watching TV, and chilling outside. They also love their walks too. Abby and Lily had a wonderful home for years until their owner passed away unexpectedly. They are currently in foster care and looking for their furever home. They are so lovable! Abby and Lily are about 10 years old and are healthy, up-to-date with vetting and house trained. They love affection and like a nice yard to lounge around during the day and they love walks. In the evenings they like to lay on the floor and watch TV with their foster family. 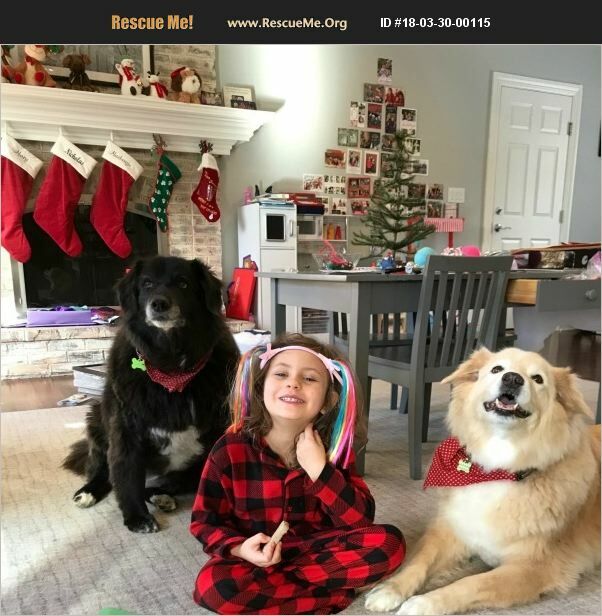 Abby & Lily's foster mom says��%BD��%BD%BD��%BD��%BD%BD%BD'��%BD��%BD%BD��%BD��%BD%BD%BD|. 'We love Abby & Lily!! They are so very sweet and all smiles! Abby & Lily are easy going and layed back. Anywhere you go they are happy to be there with you! And they get so excited to see us when we come home. It doesn't take much to make their tails wag in delight. Abby & Lily love nothing more than hanging in the yard and going for walks! When you take the leash up they get so excited and jump up and down! These siblings are wonderful with my young child and they hang out together! Everything about Abby & Lily is utterly irresistible! ' Lily loves to lounge around on the sofa, but take her for a walk and she will walk and walk and walk! She is affectionate and loves to be petted. Lily is a curious girl who loves to explore and check things out. Throw the ball and she will run after it, she also like stuff toys. Recently she saw her first built in pool and she jumped right in! And what can we say about Abby��%BD��%BD%BD��%BD��%BD%BD%BD'��%BD��%BD%BD��%BD��%BD%BD%BD|.This lovable girl knows what she wants and is not shy letting you know when she wants to be petted or when she wants to jump on the sofa or when she wants to come in from outside. Abby likes to run after balls and toys just like her sister. And just like Lily, she loves affection and will sit with you and enjoy the petting and attention! Since they have lived together all of their lives we would like Abby & Lily to be adopted to the same furever home. There is a lot to be said about an older dog, they have outgrown the urge to chew on things, they are laid back and not as rowdy as puppies. They are so laid back, and our priority would be to find a home with no dogs or cats although they are friendly with other dogs. If you are interested in adopting them and you have a loving home for them let me know. If anything is holding you back or have concerns, please let me know. If you travel, I am willing to care for them while you are away. If it's finances, maybe I can help too. I am even open to co-adopting where they can split time between homes. I am open to any suggestions to help these sibling find a furever home. We are sure when you meet Abby & Lily we know you will fall in love! If you have a furever home for this pet, please e-mail Furever Home Dog Rescue at FHDR@att.net and request an adoption application. Please note we do not adopt puppies/dogs to homes where they will be alone all day. The breed and age of this pet is listed as is our best guess. We have no background info on who the mom and dad are. We do not have a shelter facility you can visit. Our volunteers foster the dogs and pups in their homes once they have been vetted and transported here to NJ. Please read our homepage www.fhdr.petfinder.com to read how the adoption process works. And, please visit Furever Home Dog Rescue's homepage www.FureverHomeDogRescue.com to see some of our many reviews. Thank you!